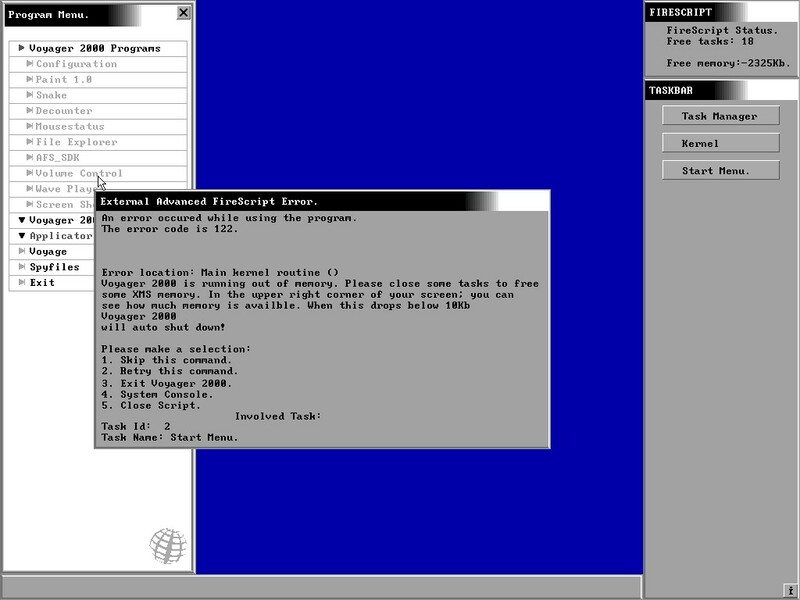 Voyager 2000 is a sophisticated GUI. It runs in SVGA using XMS. Since it runs in SVGA (using the Zephyr SVGA Library), I couldn't get a screenshot. XMS also played a part in not getting a screenshot. Eventually I got one in DOSBox. Voyager 2000 is inconsistent too. It sometimes doesn't run scripts correctly in Fire Script, the scripting engine and language in Voyager 2000. Some programs crash Voyager 2000 and others just work or make it freeze eventually. It has some interesting attributes, like advanced scripting routines, but it has some bugs with it.